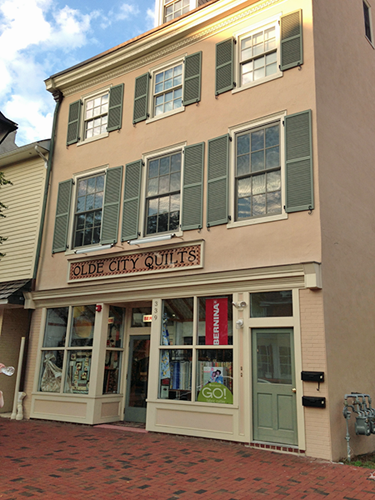 One weekend last October I flew from Phoenix, AZ to Newark, NJ, en route to my final destination of Olde City Quilts in Burlington, NJ. 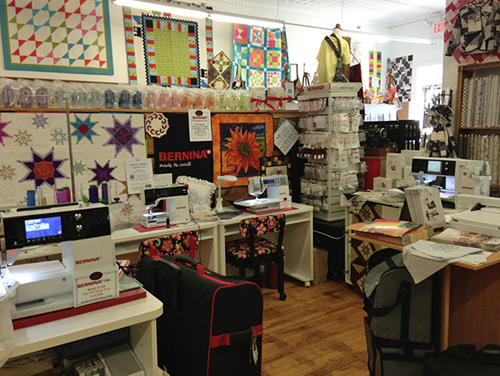 … and of course BERNINA sewing and embroidery machines! 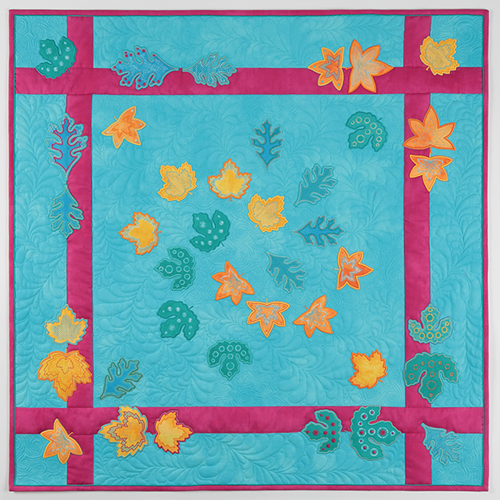 The first day was spent in the upstairs classroom with a group of students eager to improve their free-motion quilting skills in my “Quilted All Over: Spirals and Feathers” class. I love teaching this class as everyone in the class makes such huge improvements over the course of the 6-hour class. One of these days I will record the sound in the room at the beginning of the day when everyone is getting started, and then again at the end of the day when everyone has been quilting for about five hours. What a difference! In the beginning, everyone is pretty tense and the machines sound quite frantic. The “training beep” on the BSRs (BERNINA Stitch Regulators) are working overtime and going off all over the place, letting people know that they are stitching way too fast for the BSR to keep up. By the end of the day everyone has relaxed and the machines are humming smoothly. 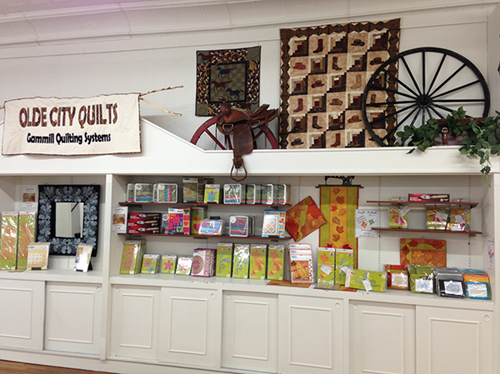 And of course everyone’s quilting has improved dramatically! That evening I did a trunk show. 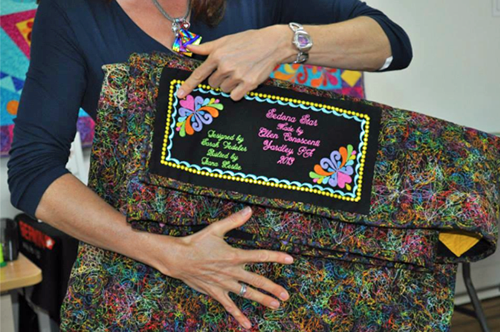 It made for a really long day – especially with the 3-hour difference in time zone from Arizona to New Jersey – but I love to share my quilts and my story with people. 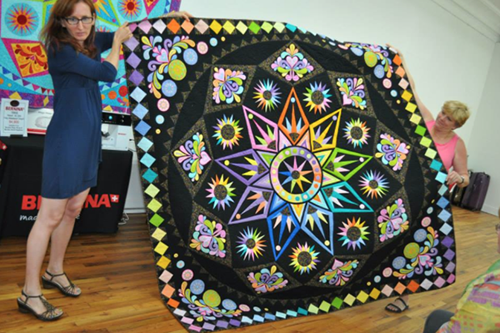 I also love it when people who have created a masterpiece using one of my design collections bring show and tell, and this night I was delighted to see my “Sedona Star” as created by Ellen Conoscenti. 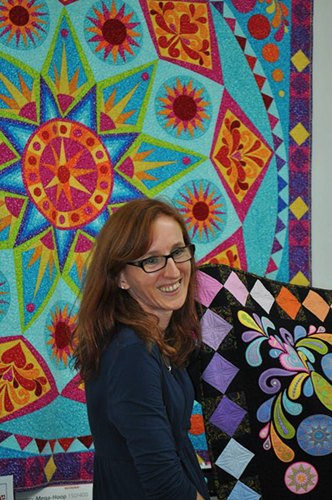 “Sedona Star” was the 2012 Block of the Month quilt for TheQuiltShow.com. 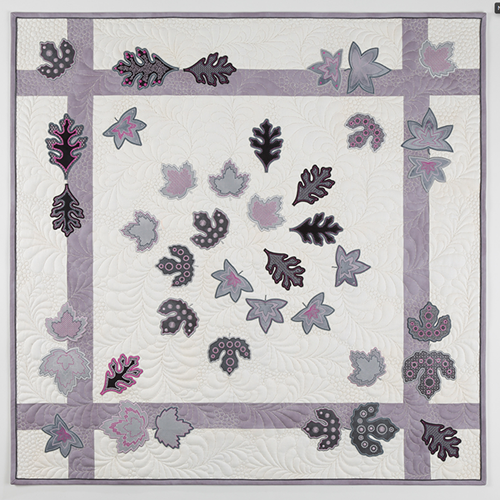 Ellen chose a completely different color palette for her quilt, and she added the embroidered appliqué from my Sedona Surprise design collection. 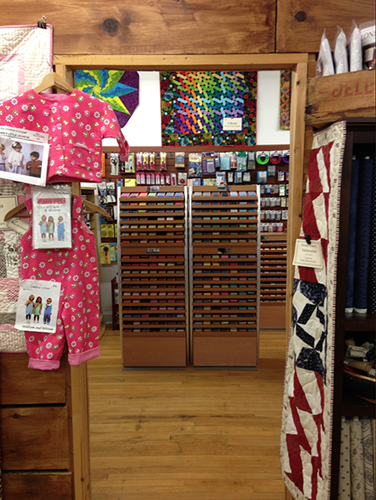 The finished quilt is absolutely stunning, as is the embroidered label that she created for the quilt! 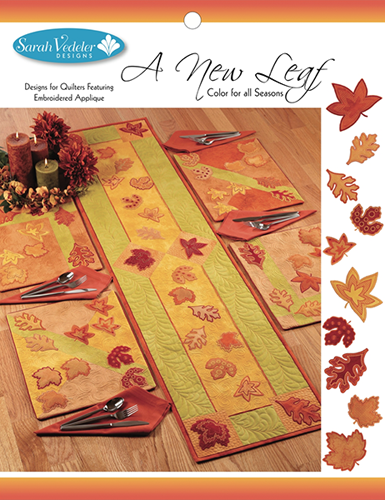 … or a table topper in Summer or Winter colors. 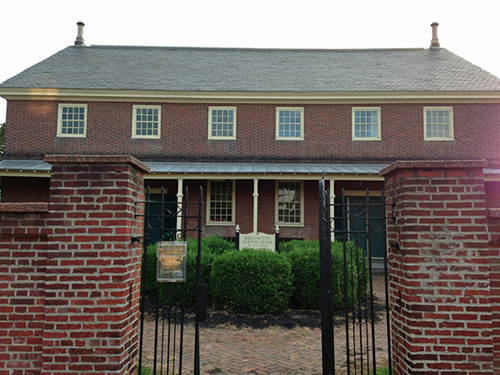 The retreat was held in the Burlington Friends Meeting House, a historic building right across the street from Olde City Quilts. Class time was spent in the social hall where everyone had lots of space to spread out and work. Lunch, dinner and snacks were also served – every few hours the call went out to “clear the benches” so that a meal could be laid out. The staff at OCQ did a great job switching roles between quilting helpers and kitchen magicians and kept us very well fed! 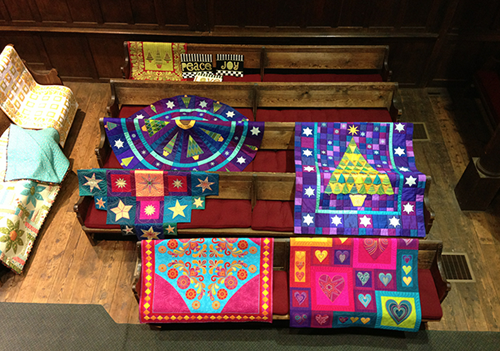 Since not everyone in the retreat had made it to my trunk show on Thursday evening, Judy laid out my quilts in the Meeting House worship room. 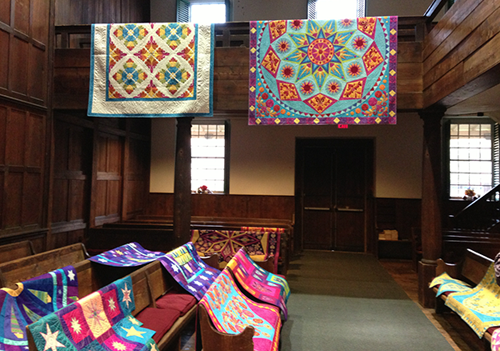 The setting made for a truly holy experience, and the light shining down on the quilts gave the room a beautiful glow. 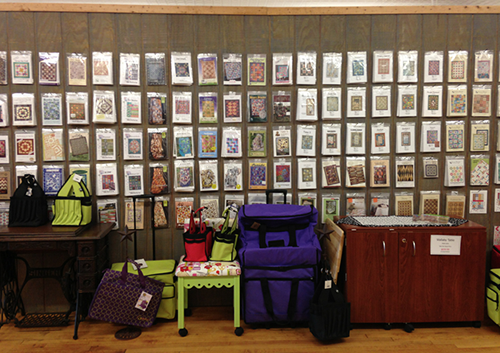 Previous Previous post: Have You Downloaded the BERNINA Accessory App?